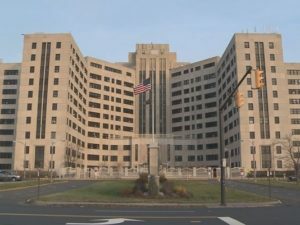 The Veterans Affairs (VA) Medical Center in Buffalo, NY is notifying over 500 patients that a recent endoscope procedure may have exposed them to a life-threatening illness. 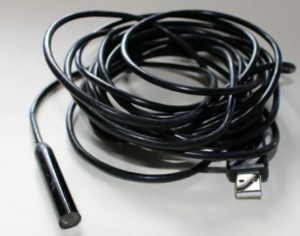 The news was reported by The Buffalo News last week, and continues the trend of endoscope-related issues across the US. “The Buffalo Veterans Affairs Medical Center is notifying 526 patients that the use of an improperly cleaned medical scope may have put them at risk of infection. 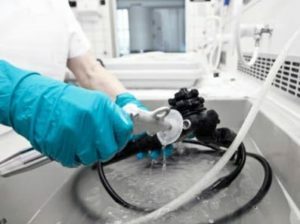 During a recent review of the disinfection process for the reusable equipment generally known as endoscopes, it was noted that steps in the manufacturer’s instructions may not have been followed in some cases by an employee of the hospital. Medical center officials characterized the risk of infection as “very low,” and announced they will offer screening to the patients at no charge. Concerns around inadequately cleaned medical scopes usually revolves around the transmission of such illnesses as hepatitis C and HIV. “Notification does not mean veterans were infected,” medical center officials said in a brief statement on Wednesday. The employee was “immediately relieved from the position,” according to the statement. The VA declined to offer any additional information — including what type of procedure the patients received, and over what time period. This isn’t the first time the Buffalo VA Medical Center’s processes have come under question. The Office of Special Counsel in 2014 cited the hospital for problems concerning safety standards for sterilizing medical equipment in a letter to former President Obama. However, the VA’s Office of the Medical Inspector reported that no rules were violated or patients harmed. This is particularly concerning on several levels—first, given the attention placed on the Buffalo VA by the Office of Special Counsel in 2014, you would think that any potential risks related to reprocessing of medical equipment would have been quickly remedied. This is on top of the 2012 incident regarding the reuse of single-use insulin pens. Despite a few warnings that there may be other issues going on, the hospital didn’t do enough to evaluate and correct its practices. Second, endoscope reprocessing has been an issue at several VA medical facilities across the country over the past several years. There was ample warning given to the other VA hospitals across the US to check the reprocessing practices at these facilities caring for some of our nation’s heroes. Third, how did poor reprocessing practices go unnoticed for what can assumed to be years, covering 526 patients? Validating employee competencies and ongoing training should be critical for every sterile processing department. A professional atmosphere that does not constantly monitor and encourage this is troublesome. The VA should have been doing a substantial deep-dive into all other disinfecting and sterilization practices given their prior issues. Relieving a poorly-performing employee does not mitigate the risks at the facility, and it’s hard to know if that employee was the only culprit or a scapegoat. This story once again reminds us how important it is to inspect what you expect. Without proper examination and verification, the steps that we take for granted every day can be skipped or forgotten by even the most competent staff member. Automated documentation systems such as iRIScope can make the capture and reporting of such steps seamless, while reducing the amount of time sterile processing staff spend documenting their work. Make sure that you work with your team to identify any potential issues in your scope reprocessing workflow, and continue to gather data and provide it back to the team to track their progress to the ultimate goal – 100% patient safety. The Joint Commission (TJC) recently released a Quick Safety update titled “Improperly Sterilized or HLD Equipment – A Growing Problem”. The release was issued in response to what TJC perceives as a growing threat to patient safety. In their analysis, they state that in 2016, 74% of immediate threat to life (ITL) declarations issued by TJC were in relation to improperly sterilized or HLD equipment. “Health care organizations are struggling with standard IC.02.02.01, Element of Performance (EP) 2, which requires organizations to reduce the risk of infections associated with medical equipment, devices and supplies. EP2 is specific to HLD and sterilization, and is applicable to Joint Commission-accredited hospitals, critical access hospitals, ambulatory and office-based surgery facilities. Noncompliance with IC.02.02.01, EP 2 has steadily escalated over the years, particularly in ambulatory and office-based surgery facilities, as well as in decentralized locations in hospitals. As threats to patient safety related to poorly sterilized or HLD equipment rise, hospitals must get in front of the problem by improving upon their existing processes. First and foremost, staff must be set up for success by ensuring that they are properly educated on the latest guidelines and techniques. 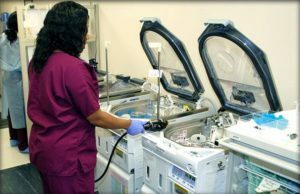 Other systems, processes and overall culture must also be improved to enable the highest levels of success in the sterilization or high-level disinfection of reusable medical equipment. Hospitals that are concerned about staff adherence to protocols can turn to automation systems such as iRIScope to get better control of high-risk processes such as endoscope reprocessing. These systems improve staff compliance by standardizing processes and automating many of the data collection workflows, enabling staff to focus on the cleaning instead of the documentation. How Safe Are Your Duodenoscopes? “According to the Los Angeles Times (04/05/17), the outbreak in Europe occurred in December of last year. The medical facility and the specific location were not identified in a report filed with the US Food and Drug Administration (FDA) by a foreign health professional conversant with the outbreak. Five people were affected, one of whom died – although that death was thought to have been associated with a pre-existing condition. The concern for Murray – and any plaintiff bringing an endoscope negligence lawsuit – remains the fact that all five individuals were felled by the same drug-resistant bacteria. What’s more, all five infections were linked to the use of an endoscope manufactured by Olympus that was recalled last year for replacement of a mechanism thought to contribute to the entrapment of bacteria that may escape cleaning and disinfecting protocols. That device – 4,400 of which are in circulation at various hospitals – is the Olympus TJF-Q180V Duodenoscope. Hence, Murray queried Olympus about the success, or lack thereof with regard to the manufacturer’s changes to the endoscope and the capacity for mitigating infection risk. Murray has a well-known and widely-publicized track record when it comes to endoscopic infection and medical device safety. In recent years the Senator led an investigation into the safety and efficacy – and infection risk – associated with duodenoscopes. Her report was released in January of last year and revealed an association between duodenoscopes made by various manufacturers and 25 outbreaks that sickened 250 patients worldwide. Of those 25 outbreaks, 19 were traced to a specific duodenoscope manufactured by Olympus. One of those outbreaks occurred at UCLA Ronald Reagan Medical Center. Three patients died. The LA Times reported that three independent investigations determined the mechanical component at the center of the Olympus recall carried the potential for spreading infection from one patient to another. The specific investigations were not identified. “This tragic incident is particularly alarming because your company recalled and reportedly fixed the device in question,” Murray wrote earlier this year. Olympus signaled that it was willing to work with Murray on answering those questions, although a spokesperson indicated it was too early to jump to any conclusions. Duodenoscopes are effective medical devices for the intervention and treatment of cancer, gallstones or other issues associated with bile of pancreatic ducts. However, they’re not cheap – $40,000 each – and thus are not disposable. Endoscopes and duodenoscopes are cleaned, disinfected and processed for re-use between patients. Read the entire article here: Are Recalled Duodenoscopes Any Safer? While duodenoscopes continue to be a focal point of legal and safety issues for all the major endoscope manufacturers, both the manufacturers and the FDA believe that the scopes currently in market are usable as long as hospitals follow the manufacturer reprocessing instructions exactly. Hospitals that are concerned about staff adherence to instructions for use can turn to automation systems such as iRIScope to get better control of high-risk processes such as endoscope reprocessing. These systems improve staff compliance by standardizing processes and automating many of the data collection workflows. As duodenoscopes continue to be evaluated for their safety and risks of infection, hospitals must be diligent in their ability to consistently follow manufacturer cleaning instructions every single time to avoid potential litigation. How Much Have Endoscope Cleaning Practices Evolved In Recent Years? The short answer is – reprocessing processes are evolving, but not quickly enough. This is according to a series of recent studies Ofstead & Associates, based in Minnesota. The two studies, conducted at UPMC in Pittsburgh and another healthcare facility in the Midwest, both showed that risks of infections spread by endoscopes still exist even when reprocessing techniques are being updated. “According to the Pittsburgh Post-Gazette (07/04/17), Ofstead conducted her first study a decade ago. Apparently, it seems, this latest effort has seen little improvement. A study of 20 endoscopes over a seven-month period was released this past January. There were visual inspections, microbial cultures and biochemical tests to detect organic matter. The research team found all scopes had irregularities (fluid, discoloration and debris), and 12 had microbial growth after cleaning. Signs of organic residue were at higher levels in the gastroscopes compared to the endoscopes used for colonoscopy. That study was released in January. Subsequently, last month Ofstead reported on another study – this time focusing on the sterilization for flexible ureteroscopes at two large multispecialty health care facilities in the Midwest – in the American Journal of Infection Control. Despite reprocessing, all 16 ureteroscopes had visible irregularities and contamination with microbial growth, hemoglobin, protein or a chemical indicating the presence of living cells. The study concluded that there should be regular checks of reprocessing practices, routine cleaning verification tests and visual inspections according to the accepted guidelines. When this doesn’t happen, there is an increased risk of potentially serious infection passed from one patient to another. While an endoscopic infection lawsuit may translate into just another legal headache for a manufacturer or a health care facility, for the patient the results can be tragic. Settling a medical malpractice lawsuit with the issuance of a check to a plaintiff will make the problem go away for the defendant, but for the plaintiff an infection could yield significant health consequences that could encumber a patient for the rest of their lives. No amount of money will make that go away, beyond lessening the financial burden. The University of Pittsburgh Medical Center (UPMC) undertakes hundreds of procedures using various endoscopes and duodenoscopes each day, according to the Post-Gazette. “These scopes are a godsend to these patients…the benefit far outweighs the risks,” Dr. Raymond Pontzer, director of infection prevention at UPMC, said in published comments. The FDA says there are easily a half-million endoscopic retrograde cholangiopancreatography, or ERCP procedures in the US every year. 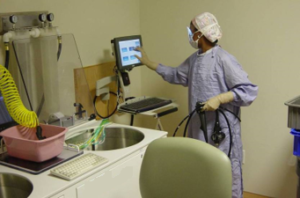 However – as any plaintiff bringing an endoscope negligence lawsuit can attest – cleaning and disinfecting the intricate device is not only job one, but a massive challenge. According to the Post-Gazette, hospitals began to see infections potentially linked to transference between endoscopes and duodenoscopes about ten years ago. However, it was an outbreak of serious infections resistant to antibiotics in 2012 – the so-called superbugs – that prompted UPMC to undertake a thorough analysis and investigation of the cleaning and disinfection protocols for its scopes. Simply cleaning the scopes according to recommended procedures wasn’t enough, so UPMC implemented a sterilization process that three years later formed the basis of current recommendations brought in by the FDA in 2015. Pontzer says that since the switch, UPMC has had no issues since. And Ofstead said her research supports recent cleaning guidelines issued by national nursing organizations representing the healthcare professionals who are on the front lines, feet on the floor and Ground Zero, dealing with these devices. But that, in itself is a challenge given that diameters of the channels within the scopes can vary: Large scopes like that for ECRP have an instrument channel of 4 millimeters. The ureteroscope channel is far narrower at 1 millimeter, the Post-Gazette reports. Pontzer told the Post-Gazette that UPMC cleans each channel of each scope immediately after use (no bedside pre-cleaning was done in the two locations in the Ofstead ureteroscope study). “After they have been reprocessed, before they are used again, we make a visual exam.” The visual exam before an endoscope or duodenoscope is redeployed for another patient is important, Pontzer says. The first trial accusing Olympus Corp. of wrongdoing associated with contaminated duodenoscopes in US hospitals has recently concluded. 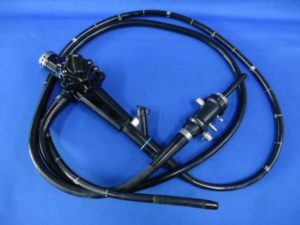 The jury ultimately decided that the Olympus duodenoscope’s design was not to blame for the death of a patient – though its lack of proper warning was determined to be partially responsible, as well as the actions of the hospital. The case surrounded the death of Richard Bigler, a 57 year-old patient who underwent a scope procedure while battling pancreatic cancer in 2013. The plaintiffs alleged that during the procedure, a tainted duodenoscope at Virginia Mason Medical Center passed on a drug-resistant infection that led to his rapid decline and eventual death. More than 25 patients and families, from Pennsylvania to California, have sued Olympus, alleging wrongful death, negligence or fraud. Federal prosecutors also are investigating Olympus and two smaller manufacturers over patient infections. Richard Bigler was one of at least 35 patients in American hospitals to have died since 2013 after developing infections tied to Olympus duodenoscopes — snake-like tubes that are threaded down a patient’s throat. Doctors use the scope to diagnose and treat problems in the digestive tract, such as gallstones, cancers and blockages in the bile duct. About 700,000 procedures are performed annually in the U.S.
Bigler’s attorneys said Olympus had acted recklessly by not warning U.S. hospitals about previous outbreaks and failing to fix a design flaw that allowed dangerous bacteria to become trapped inside these reusable scopes. Olympus criticized Virginia Mason for not telling the Biglers and other families about the scope-related infections, leaving them to find out from a newspaper account about the outbreak. In his closing argument, Olympus attorney Mark Anderson told the jury that the Seattle outbreak would have occurred regardless of whether Olympus’ or another company’s devices were used. One of the largest superbug outbreaks in the nation occurred at Virginia Mason, where 39 people’s infections were linked to Olympus scopes. Eighteen people died. The Seattle hospital said the patients who died, including Richard Bigler, had other underlying illnesses. The somewhat surprising verdict that the Olympus scopes were not to blame, but instead that Olympus’ lack of warnings and the hospitals actions were to blame, is sure to put hospitals on high alert. The precedent set by this trial verdict now puts the onus on the hospital to prove that their processes and procedures are of a sufficient standard to avoid the blame falling solely upon them in the case of an endoscope-related outbreak. In such a case, documentation of rigorously followed procedures will become a must have for the hospital’s defense. Automated documentation systems such as iRIScope can make the capture and reproduction of such documentation seamless, and reduce the amount of time sterile processing staff spend documenting their work. This documentation can be the difference between successfully defending hospital staff in court and severely damaging a hospital’s reputation and pocketbook by losing a lawsuit related to patient safety. On July 21, 2017, Fujifilm Medical Systems USA issued an Urgent Medical Device Correction and Removal notification to inform customers of a recall of its ED-530XT duodenoscopes. This voluntary recall includes the replacement of the ED-530XT forceps elevator mechanism including the O-ring seal, replacement of the distal end cap, and the provision of new Operation Manuals. The U.S. Food and Drug Administration (FDA) cleared the updated design and labeling for the ED-530XT on July 21, 2017. “BACKGROUND: As noted in FDA’s February 2015 Safety Communication, the complex design of duodenoscopes may impede effective reprocessing. Reprocessing is a detailed, multistep process to clean and disinfect or sterilize reusable devices. The FDA has been working with duodenoscope manufacturers as they modify and validate their reprocessing instructions to further enhance the safety margin of their devices and show with a high degree of assurance that their reprocessing instructions, when followed correctly, effectively clean and disinfect the duodenoscopes. Acknowledge Fujifilm’s Urgent Medical Device Correction and Removal and identify affected products in your facility. Indicate if you do NOT have any affected duodenoscopes or Operation Manuals. Kaiser Permanente’s Largo Medical Center in Maryland has issued a notice to 23 patients that they should undergo testing following the use of an improperly disinfected flexible endoscope in their cases. This recall, coupled with the recent issue at an armed forces facility in Qatar, continues to remind us of the risks that improperly reprocessed scopes represent to our patients. “We are reaching out to 23 patients to let them know that a piece of endoscopy equipment at our Largo Medical Center in suburban Maryland had a defect that might have kept it from being thoroughly disinfected. Kaiser Permanente follows nationally recommended protocols for the cleaning and disinfection of all equipment used during procedures to ensure the safety of our patients and that all potentially transmissible infectious agents have been removed. The scope in question was disinfected following the recommended protocols before its use. However, after discovering the defect and conducting subsequent analysis, we determined that we cannot guarantee that the sterilization process was fully effective. Even though our physicians believe the risk of illness in this situation is minimal, gastroenterologists are contacting the 23 members who underwent a colonoscopy/upper endoscopy at the Largo Endoscopy Unit to explain the situation and ask them to come in for some screening tests. Each member’s primary care physician will work closely with them to ensure appropriate care is provided. All members will also receive a letter from Kaiser Permanente. Rapid outbreaks call for rapid responses – Kaiser Permanente seems to have caught this issue before it created issues for even more patients. Make sure your facility is prepared to do the same by having well-documented procedures and inspecting that they are being followed as designed. If you believe your hospital could use some help thoroughly documenting its procedures, automated systems such as iRIScope can make the capture and reporting of such steps seamless while reducing the amount of time sterile processing staff spend documenting their work. The recent revelation of a potential endoscope-related outbreak at the Al Udeid Air Base in Qatar reminds us once again of the risks that improperly reprocessed scopes represent to our patients. This unfortunate episode potentially exposed 135 airmen to such diseases as HIV, hepatitis B and C and other potentially fatal bugs. This is particularly concerning on several levels—first, given all the attention that was placed on duodenoscope reprocessing, healthcare facilities have ramped up disinfection monitoring methods for all flexible endoscopes to ensure compliance and avoid adverse events. Was this increased scrutiny not present at the Al Udeid clinic? Third, how was this violation found? Given the length of time these poor practices persisted, perhaps a shift to a culture of Just-In-Time practices is needed, which highlights drawing attention to near misses as a learning, rather than punitive, tactic. The recent issues surrounding scope-related infections continue to gather media attention. A recent article by the Pittsburgh-Post Gazette follows the story of how UPMC in Pittsburgh, PA has managed its endoscope reprocessing since a scope-related outbreak in 2012. In the article, UPMC points to its adoption of additional steps added to its reprocessing guidelines since 2012, and attributes the new steps to its experience of “no issues since”. “In June’s American Journal of Infection Control, Ms. Ofstead reported the results of her study of sterilization for flexible ureteroscopes at two large multispecialty health care facilities in the Midwest. Despite reprocessing, all 16 ureteroscopes had visible irregularities and contamination with microbial growth, hemoglobin, protein or a chemical indicating the presence of living cells. The study concluded that there should be regular checks of reprocessing practices, routine cleaning verification tests and visual inspections according to the accepted guidelines. UPMC has had no outbreaks of infection from scopes since the ERCP experience, and Dr. Pontzer is confident new endoscope practices are working. He explained UPMC has found it is best to clean the channels of each scope immediately after use. No bedside precleaning was done in the two locations in the Ofstead ureteroscope study. Read the entire article here: Endoscope safety: how clean are those reusable medical scopes? Many of the emerging best practices surrounding endoscope reprocessing require hospitals and endoscopy clinics to re-examine the way they are handling used scopes. Many of the steps require additional pre-cleanings and visual inspections to make sure that any risk of infection is minimized along the way, adding additional checkpoints to catch certain issues that can be overlooked. If your department is looking at re-designing its scope reprocessing practices, having software that can allow you to track each step along the way may be a critical component. Systems such as iRIScope can change and grow with your organization to manage the endoscope cleaning process and ensure that all your new or improved steps are being followed every time.